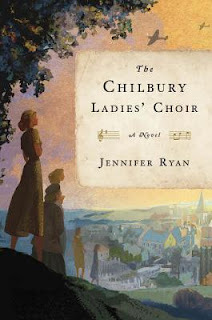 We met at Shirley's home to discuss Jane's book choice The Chilbury Ladies' Choir by Jennifer Ryan. Present were Beth, Colette, Jane, Janet, Linda, Michèle and Shirley. As usual, Shirley had a wonderful array of food for us, crab rolled sandwiches, stuffed cherry tomatoes, pigs in a blanket and wonderful bacon and fruit tarts. She had a wonderful clementine cake, a Nigella Lawson recipe. Click on the link to get the recipe. This is Jennifer Ryan's first novel. She was born in England and now lives in Washington DC with her husband and children. She was a book editor specializing in non-fiction books such as economics, politics, health and biographies. The Chilbury Ladies' Choir was inspired by stories her grandmother told her, who was 20 when WWII broke out and who lived in a small British village. The story is told in the novel through letters written by some of the characters and journal entries by other characters. It is similar to an epistolary novel Pamela; or Virtue Rewarded by Samuel Richardson told through a series of familiar letters. It could also be compared to Henrietta's War: News from the Home Front 1939-1942 written by Joyce Denny's and part of the Bloomsbury Group. As we read the journal entries and letters we not only learn about what is happening in the village of Chilbury during 1940 from March to September but we become acquainted with the main characters, Mrs. Tilling, Kitty, Venetia and Edwina Paltry. In reading the letters and journal entries we become familiar with other characters in the novel such as Prim the choir master, the Brigadier, Kitty and Venetia's father, Colonel Mallard, Henry and his fascination with Venetia and Kitty's puppy love for him, and Mr. Slater who Venetia targets on a dare by her friend Angela. Most of us enjoyed the novel and found it a nice light easy read with interesting characters and a good story line. The map of the village and the descriptions of the different buildings and areas of the village allowed us as readers to imagine the characters in their environment. The Ladies Choir is a good unifying tool, allowing us to observe the interaction between the characters and also showing how, when war left a village with only the women and older men, the strengths and backbones of the village came from the women. Several members commented on how characters such as Venetia, Mrs. Tillings and Henry evolve as events happen and the story line changes. At the beginning though Hitler is taking over many areas of Europe, England is unaffected, it is almost like a phony war. As events occur and Hitler begins to bombard southern England, Dover is constantly hit and Chilbury is bombarded, the deaths of husbands and boys and those of loved members of the village, Prim and Harriet changes the narrative in the journals and letters. Venetia matures, not only because of these events but also because of her growing love for Alastair Slater. Mrs. Tillings becomes less timid and develops as a strong supportive person. Some felt that there were some areas where we were left hanging a bit. What happens to Mrs. Tilling's son David? Does Edwina really get away without consequences? Some also felt that Kitty's journal entries were not the narrative of a 13 year old. Though we found the book to be an easy light read, it had excellent character development, good references to how WWII affected England and villages. It had two good love stories and though many events were quite predictable such as the baby swap and Mrs. Tilling and Colonel Mallard's developing relationship, it was enjoyable to read. Thank you Jane for a good choice.